The martingale, which is often referred to as the “humane choke chain,” is a great training tool when used appropriately. Best known as being used on greyhounds that are prone to slipping out of collars, thanks to necks that are significantly wider than their heads, these collars are also great for dogs that routinely escape collars or harnesses. 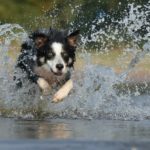 There are certain precautions that pet owners should take, however, when finding the right martingale dog collar for their needs. A martingale collar is composed of two loops: one large loop, which goes around the dog’s head, and a second smaller loop, which attaches to the leash. 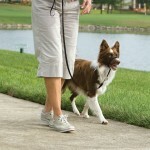 When pressure is applied to the leash, the smaller loop will tighten the larger loop, placing pressure on the dog’s neck. This method is considered more humane than a typical choke chain because the wide fabric ensures that pressure is more evenly distributed around the neck, rather than solely on the esophagus. In addition, the collar will tighten when a dog tries to back out of the collar, preventing escape. A martingale should be used for training purposes only, such as during walks or obedience training. These collars, or any collar or harness that tightens when pressure is applied, is not suitable for full-time wear. Simple accidents, such as the dog getting the second loop stuck on a fence or door knob can occur, leading to injury or death. In addition, the collar should never be used in the same manner as a choke chain where quick tugs on the chain are used to correct the dog. Instead, owners should apply gentle pressure for correction. There are two types of martingale collars: one where the second loop is made of a nylon material (same as the collar), and one where the second loop is made from a chain. The nylon material is preferable for many reasons. One, the collars that are fully nylon have a quick-release feature which is necessary if an emergency arises. 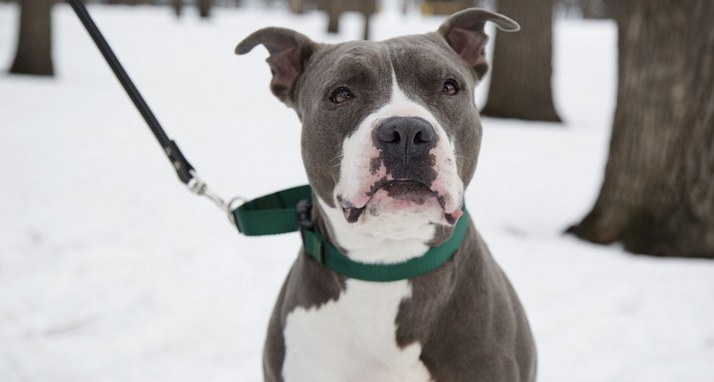 Second, there have been many reports of martingale collars with chains becoming stuck or tangled after tightening, leading to injury or death in dogs. Proper use of the martingale collar requires appropriately adjusting the collar to fit your dog. As the collar tightens, two pieces of metal hardware will be brought closer together on the large loop of the collar. On a collar that is too tight, these two pieces of hardware will already be close to one other, within an inch or two apart, without any pressure having been applied. On the other hand, the two pieces of metal hardware shouldn’t be so far apart from one another that the collar is too loose. The best fitting collar will have the two pieces of hardware positioned approximately 3 inches from one another. 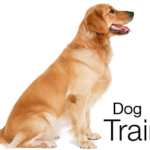 This method will ensure that the dog cannot escape the collar, and that proper training cues are given at all times.